Zoiks! Online - The Very Best in Stand-Up And Music! : "Frank Caliendo impresses both NFL Fox Sunday and MADtv crowd." "Frank Caliendo impresses both NFL Fox Sunday and MADtv crowd." 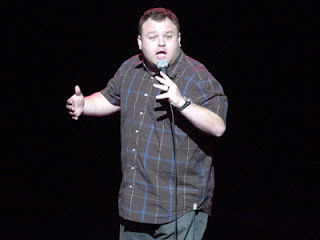 Frank Caliendo began doing impressions at the age of birth. On one day, a sunny one perhaps, his mother noticed that he nailed a perfect Dudley Moore impersonation. Of course, his father reasoned that all babies act like they’re drunk and throw up on themselves. But his mother saw something and it was at this time, Frank’s parents believed he could be funny. He began doing stand-up comedy and soon after, Frank was being funny on MADtv, Fox NFL Sunday and his hit show, Frank TV. I had the opportunity to sit down with the comedian, impressionist and actor for a chat about his many roles on television. Q - You took over for Jimmy Kimmel on Fox’s NFL Sunday. One could argue he left because of his own talk show. I think he and Terry just didn’t get along. How is your relationship with the guys? A - Well, part of the gig is making fun of the guys, and getting made fun of as well. If you're going to have to dish it out, you have to be able to take it. I think Terry (Bradshaw) liked Jimmy. My relationship with the guys is pretty good. Howie (Long) has offered to be in sketches. At the NFC Championship dinner last year, all the guys made fun of me, but they also had some really nice things to say, especially Jimmy Johnson. Q - You do lots of impressions. How hard is it to perfect an impression and do some just not come out right? A - All the impressions just take work. They're always getting better. I listen to my stuff from two years ago and think I was terrible then. And yes, there are tons of impressions I can't do and you don't see me do them because they're bad. Q - One of my favorite impressions is the one you do of Coach John Madden. Has he ever gotten mad? And if the two of you were in a scuffle, who do you think would win? A - I've heard that John doesn't like the impression - there's nothing I can do about that. I do wish he liked it. But if we got into a scuffle, I think he'd win by eating me. Q - Who was your very first impression of and has that person heard your version yet? A - Jay Leno was one of the first. I can't remember if he was "the" first, but he's seen the impression on MADtv and he liked it. He told me face to face at the Comedy And Magic Club in Hermosa Beach, California. Q - How do you decide who you are going to impersonate? A - Sometimes I get assigned by the Fox Pre-game and sometimes I just like what a celebrity does. I just find a way to mimic it - it’s fun for me. Q - What did getting the MADtv gig mean to you and what did it do for your career? A - I think it’s made me a bit more recognizable. I've also had the chance to learn a lot while being on the show. Q - What’s the best advice someone has given you? A - I was once told to "learn how to do John Madden's voice"- that seems to have gone well for me. Q - Jim Carrey used to primarily do impressions. He stopped and his career became huge. Do you feel impressionists don’t get the same love as comedians who do more of a traditional stand-up act? A - Nah. You need to do other stuff as a comedian, but if you have material and can do impressions, you have the world in your hands. Q - Do you like to call random people up and do impersonations so that the people you call think you are really that person? A - No, I don't do that kind of stuff. I've fooled some friends for a minute, but that's about it. I'm not into crank yanking. Q - Who is your favorite person to impersonate? A - Robin Williams, Al Pacino, President Bush, Jim Rome and John Madden are my favorites. Q - How do you decide who you are going to impersonate and did you realize I’ve already asked you this question? A - I was actually getting upset that you'd asked it already, and that's when I knew. Now I'm just laughing with ya.